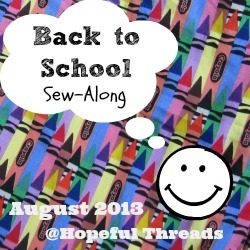 This month, I'm joining in with Kristy, from Hopeful Threads, making pencil cases to help Sew for Kids. The pencil cases, along with other school supplies, will be distributed to children on the Pine Ridge Reservation. Sandra, from Sandra Sews makes LOTS of pencil cases (along with all sorts of zippered pouches) for a charity organisation, so I checked with her about the tutorial she would recommend. Her suggestion was the Front Zip Pouch by Sew Mama Sew. Sandra has made at least 100 of these pouches in various sizes, so that's a recommendation in itself. Sew Mama Sew's free tutorial can be downloaded from Craftsy. As well as a PDF file, there's a video of the whole process. 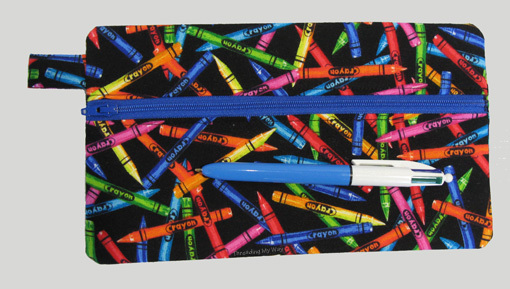 The section in the PDF file for the pencil case is only a couple of pages in length, as there are no photos. I rarely print the many pages in most tutorials, but as it was only two pages, I did on this occasion and sat them next to my machine. It looked easy enough... I didn't think I'd need the video. WRONG!!! 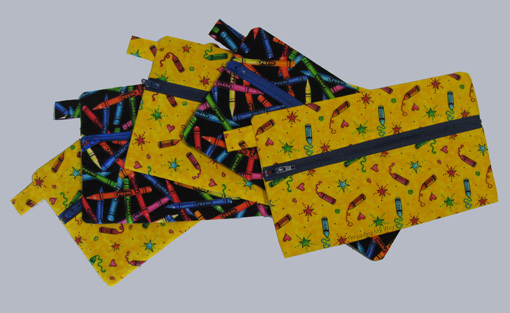 My first pencil case was decidedly wonky, as a result of incorrectly sewing the lining and exterior fabrics. After a quick look at the relevant section of the video, out came my trusty seam ripper. I resewed the last section and it was all done. I should have listened to Sandra, who suggested I look at the video... LOL!!! Once I had referred to the video, it was easy as. I used fabrics from my stash. The black fabric is the same as I used for the No Guts Boxie Pouch. Sadly, I've only tiny scraps left of this one. I love how easy it is to insert the zip!!! The zip lies flat at the ends and as it's away from the corners, it alleviates any problems that can occur with zippers and corners when the zip is placed at the top of a pouch. Having said that, I mucked up the first zip. The end with the zipper pull was twisted a little... hmmm, not really being careful. It was only a slight cosmetic problem, so I left it. On some of my pouches, the bottom seam ended up not quite on the bottom, but can just be seen on the back. I'm thinking I made the seams too narrow when inserting the zips. Again, only a slight cosmetic problem, but one I'll easily be able to rectify next time. I'll most definitely be using this tutorial again!!! Instructions are given for making the pouches in several sizes, including one to fit an iPad. Thanks, Sandra, for your suggestion. It really is a quick and easy make. As soon as I saw the first picture on this post I knew which tutorial it was - your bags look GREAT! The kids will love those fun designs - and as you've probably found, each bag gets easier and easier :D I love that she used a technique that eliminates raw edges inside :) BTW - sometimes when I layer my front/back/lining to stitch it together, my lengths are different as well - as you mention, likely due to the zipper installation. Easy fix - just stitch the top seam with the layers in place, then trim the bottom evenly - I usually end up taking about 1/4" off of one of the layers :D My stitching isn't always accurate (lol) so a quick trim and everything is even! These are great Pam, will have to check out the tutorial and the video! Great little bags Pam! My zippers are never quite perfect:) I just love seeing all the nice things you do for people. What a good influence you are! well done on persevering, they came out great. As Sandra is the pouch guru, she should always be listened to and obeyed! These look great and for a good cause. As a former teacher, I always had extra supplies for my students. I am sure they will be loved. Very sweet! Fun fabrics for kids too! Did you get the email about winning my giveaway? They look amazing Pam! Thank you so much! Love the pouches! I need to go check out that tutorial as I recently got past my zipper-phobia! I had such a hard time finding pencil cases this year. I love this because I can personalize it for the kids. Thanks for sharing! Cute pencil cases Pam - I do love those fabrics! 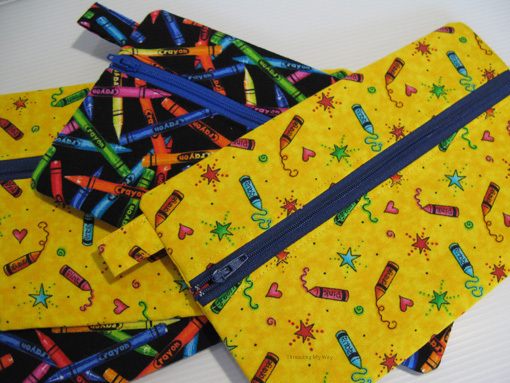 Great job on the pencil pouches. Wonderful project. What neat pencil cases and fabrics! Thanks for sharing.